A gunman wearing an Afghan army uniform opened fire Thursday on participants in a meeting with the top U.S. commander in Afghanistan, killing three top southern provincial officials and wounding at least three Americans, officials said. But Gen. Austin “Scott” Miller, the target of the attack claimed by the Taliban, escaped unharmed, they said. Among those reported killed in the attack inside the governor’s compound in southern Kandahar province were the country’s top police general, Abdul Raziq, who was seen as the most powerful man in southern Afghanistan. U.S. military officials confirmed that a U.S. soldier, a contractor and another civilian were wounded in the attack, which occurred shortly after a high-level meeting attended by Miller. 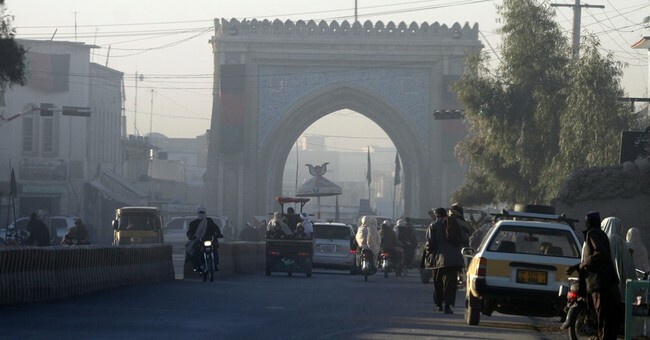 Initial accounts said the three senior Afghan officials were wounded in the shooting in Kandahar. UPDATE 1: My source tells me the #Kandahar governor's bodyguards turned their guns on their own colleagues and U.S. military officials. Two Americans wounded and evacuated. Top U.S. commander in #Afghanistan present but unhurt, says NATO. UPDATE 2: #Kandahar police chief and the intelligence head were killed immediately in the attack; governor died of injuries in hospital, my source says. Our ventures in this part of the world haven’t panned out. We dropped the ball here to invade Iraq in 2003. On both fronts, mishaps and miscalculations, especially on the notion of whether democratic ideals could take hold in a part of the world where this is an alien concept historically, along with the American public’s impatience, only compounded matters. We’ve wasted trillions in these ventures, along with thousands of American lives. Things have not died down or gotten better it would seem. The security and governing structure in southern Afghanistan just got wiped out.